With the dawn of the more advanced pool cleaning equipment, vacuuming leaves and twigs seem to be a challenge for most manufacturers. The guarantee to lift and take in piles of leaves does not seem absolute even for the most advanced pool cleaners. Even the most expensive ones with the biggest filter baskets will need help on pool cleanups during fall. Nobody wants to compromise the durability of their robotic pool cleaners or filtration systems by overworking it. So, it is never a bad idea to go back to basics and choose to complement your most advanced pool cleaners with another equipment that is built for this specialty – leaf vacuum for pools. A pool leaf vacuum is a piece of hand-held equipment that is used to suction piles of leaves and twigs in the pool. These are also called leaf gulper, leaf bagger and leaf vacuum. And with these different names are different ways and mechanisms built in each leaf vacuum with the same purpose. We have checked out the most popular pool leaf vacuums and here are the best ones in the market today. The Pool Blaster is a pool leaf vacuum that is equipped with a propeller that creates a whirlpool in the water and eventually lifts the leaves and debris towards the bagger. The bagger that comes with the standard kit is replaceable if you prefer a bigger bag. Unlike other pool leaf vacuums, it does not need a garden hose connection or water pressure to work. It is powered by eight (8) pieces of AA batteries and can continuously run for 3 hours. The propeller is made out of plastic, so it is guaranteed safe. All hardware is made out of molded plastic as well so it will not rust. The equipment comes with a handle that is compatible with standard vacuum poles. It is advisable to lift the pool vacuum out of the pool by holding the bagger after turning it off instead of simply carrying it out to prolong the life of the handle and vacuum head. 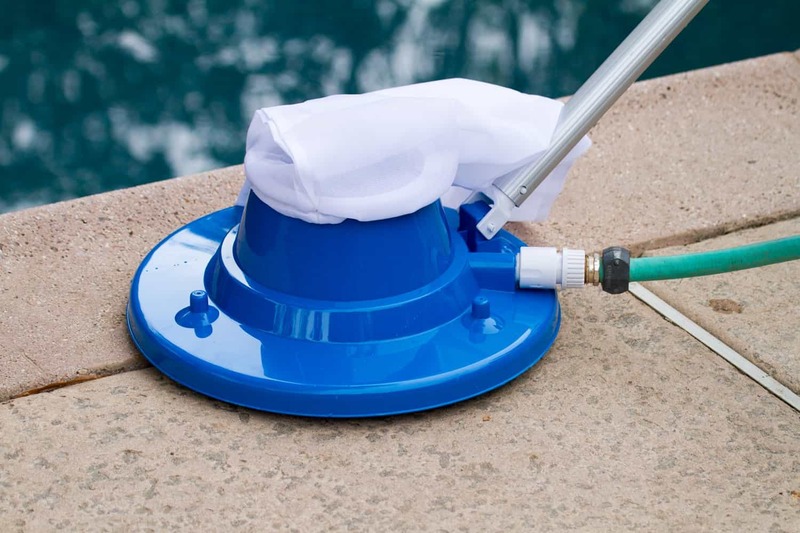 One exciting feature of this leaf vacuum is that you can turn it upside down and use it as a skimmer for leaves floating on the surface of the pool. If you don’t mind spending a little extra for the batteries every time you need to use it, then the comfort and functionality of the Watertech Pool Blaster will surely convince you to buy it. With this choice, you don’t just have a pool leaf vacuum, but you also have a pool skimmer when you turn the vacuum head upside down. The Blue Devil Leaf Bagger is an effective pool leaf vacuum that works even on big bunches of leaves and twigs. It is a traditional set of a leaf vacuum and bagger that is meant to be moved around the pool using a telescopic pole. It can be navigated around the pool in a fluid motion, thanks to its metal swivel handle and urethane bearing wheels. It works on the Venturi principle which is the most common mechanism that is used for pool leaf vacuums and other home appliances. For it to work, it should be attached to a garden hose. Once water pressure gets through the pipe, it creates a suction or vacuum effect on the equipment towards the bagger and engulfs the leaves. It has a water shut-off valve installed in the unit itself, so you don’t have to head to the water source if you need to turn it on or off. ​It requires water to make it work, not environment and cost friendly. Similar to most leaf baggers in the market today, the Poolmaster 283000 Big Sucker Pool Leaf Vacuum does not require electricity or batteries for it to work. It makes use of the suction effect that water pressure creates once water passes through its 8 high-pressure water jets underside. Its 4 multi-directional wheels make navigating around flat surfaces and mild slopes an easy task. 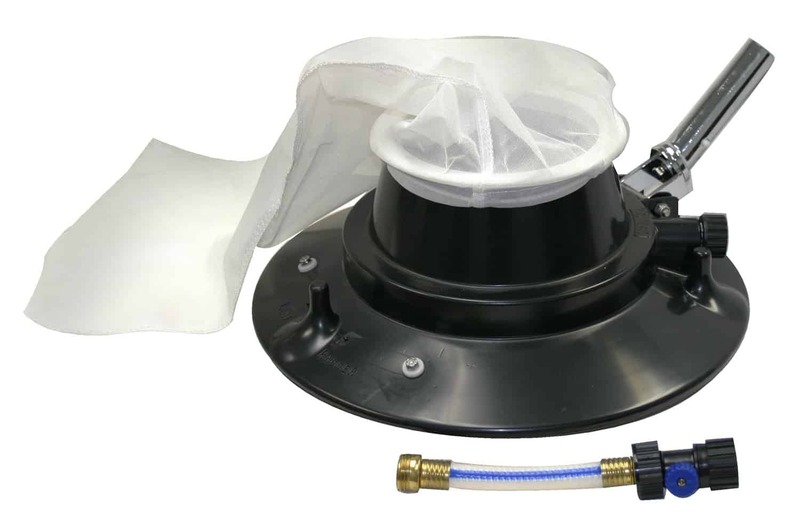 The large 15” diameter vacuum opening also means it can accommodate larger loads of leaves and can cover a more significant area. It also comes with a built-in quick disconnect valve that fits any standard size garden hose. It comes with a reusable, multi-purpose leaf bag that will fit the vacuum neck perfectly using its push-lock closure. It is also tightly secured by a vacuum ring. 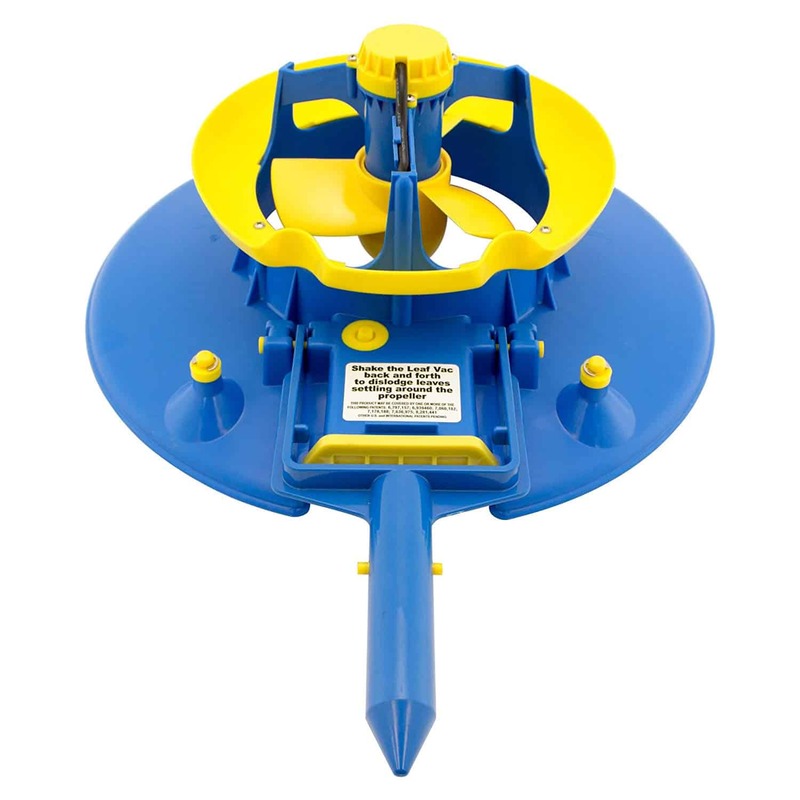 Its wide diameter opening will surely shorten your leaf removal time. It is also easy on the pocket and the vacuum is light and easy to take around. It might have the tendency to lift or topple so you might need a heavy pole to guide it through. 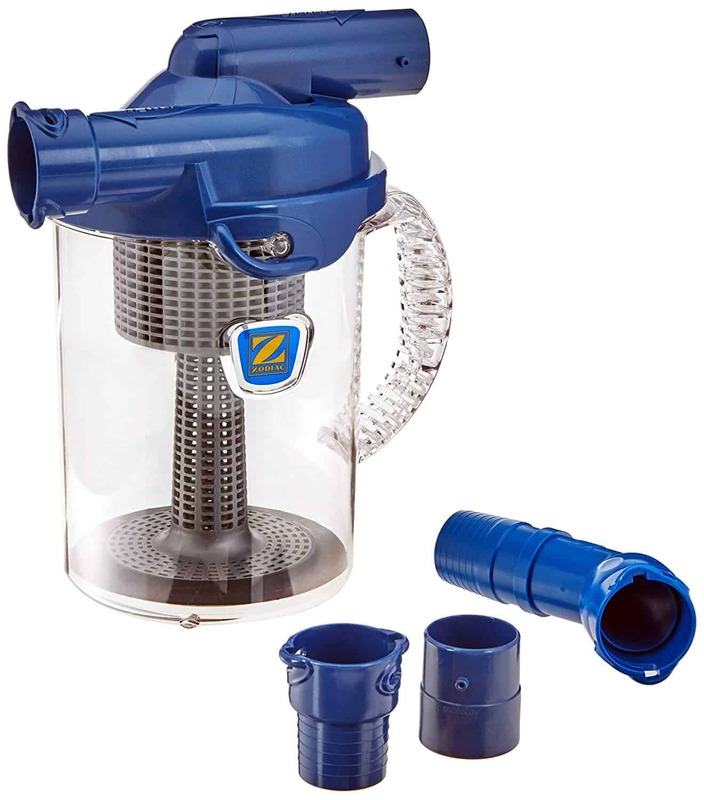 It is not a pool leaf vacuum per se, but for those who are using a suction side pool cleaners, this is a perfect addition for your vacuum set that will also help you preserve your pool skimmers by preventing clogged skimmer baskets and filtration system. Zodiac Cyclonic Leaf Canister is an accessory that serves as a leaf gulper before the leaves and debris reach the skimmer basket. Just connect the leaf canister in between two hose sections of the suction-side vacuum hose. Both easy connect fittings are compatible with most suction pool hose. You will never have to touch debris again nor suffer from a blocked filtration system. The canister has a strainer inside and you only have to twist it open, lift the strainer and empty the canister without touching the leaves it caught. The material is durable and easy to clean. This accessory is beneficial and convenient. It proactively prevents messy cleanup and emptying of the skimmer basket and the possible strain on the filtration system caused by large leaves and twigs. It is a leaf gulper suitable for suction side cleaners. Stanley is a well-known brand for its home tools and storage products. One of their home and garden products is the PoolTec Leaf Vacuum. 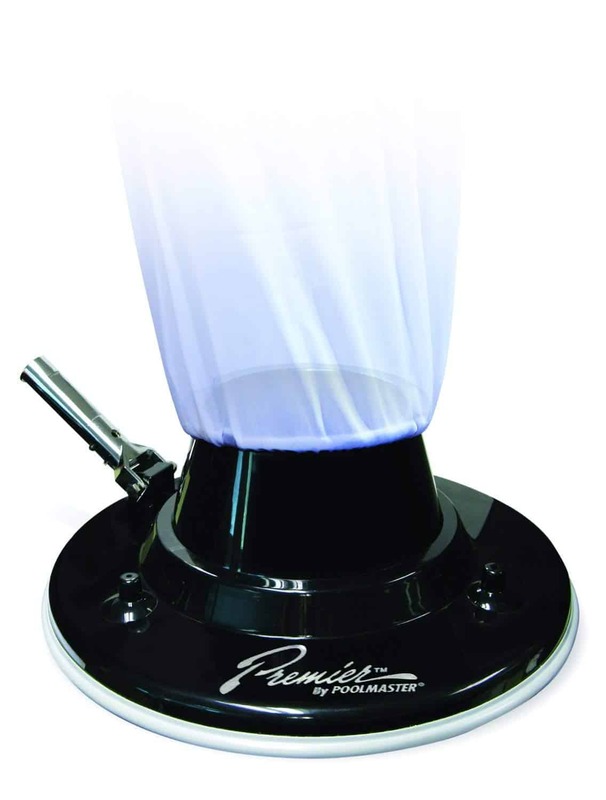 It is a 15’’ diameter vacuum with an extra large opening. The underside has 8-high pressure jet outlets for the efficient suction of large piles of debris and leaves. 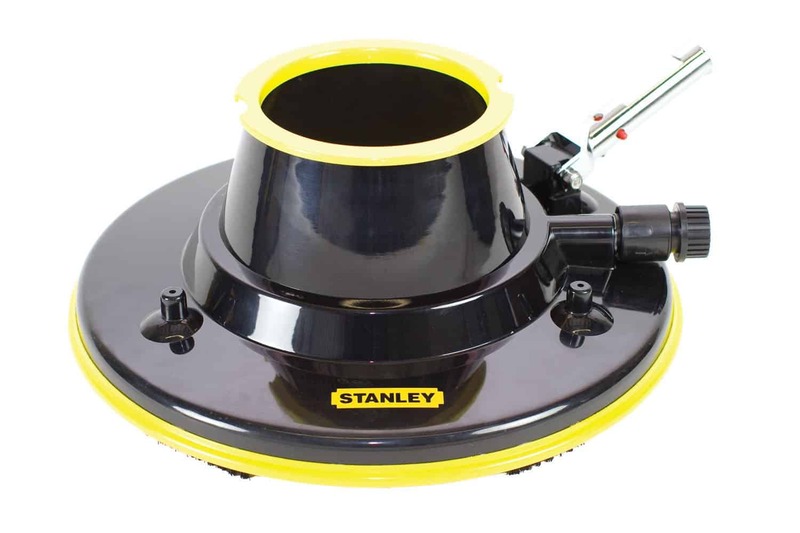 Unlike other pool leaf vacuums, Stanley Leaf Vacuum has a rubber bumper surrounding the vacuum base to protect the pool surfaces from scuffs. It has a chrome finish handle that will fit standard pool and garden poles. Aside from taking care of the leaves, it also cleans the pool floors with its interchangeable brush. The wheels smooth rotate to any direction and replacements are readily available in the market. Pentair used the term “leaf eater” for their pool leaf vacuum because it does that using its wide, 16” diameter vacuum bottom. It can lift as many leaves that would fit in its 2-feet long leaf bag which is its standard inclusion. Unlike other brands, Pentair Leaf Eater explicitly described this leaf vacuum as suitable for vinyl-lined pools and in-ground pools. It also cleans while it vacuums with its built-in brushes. All hardware is made out of durable plastic and will not rust. The large leaf bag that comes in the standard package of this pool leaf cleaner is a pleaser. Imagine not spending extra dollars for getting a bigger one and not having the need to empty the leaf bag in between the cleaning cycle. This product falls under the Premium Collection of pool leaf vacuums of Poolmaster. If you will start assessing the model based on its appearance, there is indeed a premium feel to it. Its black vacuum head matched with an aluminum metal handle gives it a more sturdy look and feel. The vacuum is also equipped with a bumper to avoid damaging the surface of the pool. The same principle of lifting leaves through water pressure coming from the garden hose will make this work. It will fit standard garden poles, or you may purchase a pole of the same brand to ensure that it matches the handle well. This pool leaf vacuum is also surprisingly light at 1.82 pounds despite its size and the brushes and bumper it comes with. Poolmaster is an industry leader in pool cleaning supplies. This upgrade of their earlier models of pool leaf vacuum is worth your consideration. The built-in brushes are said to get in the way of the leaf vacuuming process but with a little adjustment in the water pressure and navigation can do the trick. How to Maximize Use of Your Pool Leaf Vacuum? Pool leaf vacuums are still far from perfect. These are mechanical tools that will complement your usual pool cleaners. These are ideal for those pools that are surrounded by a lot of trees, exposed to strong winds and to be used during fall. The size of the leaf bagger that you will use will also maximize the efficiency of this equipment. 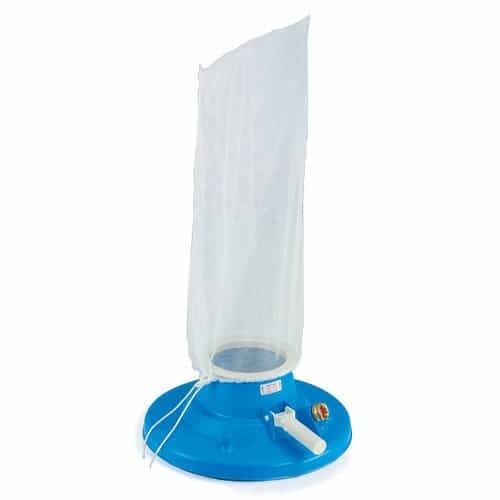 The standard leaf baggers that come with the pool leaf vacuums are usually called “all-purpose leaf bag.” These bags have medium sized holes to ensure that water flows out of the bag leaving enough pressure for the vacuum to work correctly even if there are plenty of leaves inside the bag. However, these leaf bags are usually not big enough, so the users tend to empty it in between the cleaning activity. There are longer leaf baggers available that will help users accommodate more leaves without getting in the way of the water pressure. If aside from leaves, some debris and sediments are floating around your pool, leaf baggers with smaller or finer mesh can also be purchased as a backup. Ideally, the garden hose you will attach to the pool vacuum should be the same length as the pool itself or longer. This will give enough room to move and navigate the pool leaf vacuum around. Most of the leaf vacuums featured in this review work with water pressure. Water pressure is key to better suction of leaves and it is not reliant on the holes at the bottom of these leaf vacuums. Likewise, make sure your hose does not have leaks and is not tangled. Pool leaf vacuums need to be navigated smoothly. Rust and corrosion will affect the performance of the wheels and will surely affect the suction capabilities of your equipment as well. Make sure that the wheels and wheel attachments, handle and locks are all made with non-metal hardware. Pool leaf vacuums literally go through something rough at the bottom of your pool. Although most wheels are made durable plastic materials, lodge debris, pebbles and twigs might get in the way of the efficiency of your pool leaf vacuum. In case of wheel damage, replacements are readily available from Amazon or through your pool supply and hardware stores. If you have decided to use the battery-powered pool leaf vacuum, you might want to consider getting a water sealant for the battery cover. Pressure is greater underwater. This might cause a small amount of water to enter the battery cartridge. This will corrode the battery and might damage the pool leaf vacuum as a whole. Even though you intend to use the pool leaf vacuum several times in a week, removing the batteries after every use will help you assess the occurrence of leaks and prolong the life of the battery as well. If you’ve used the leaf vacuum for more than three hours in an instance, it is best to use a new set of batteries on the next cleaning cycle for optimum performance. Pool leaf vacuums are made using different materials. With proper cleaning and storage, you can surely keep this tool for an extended period. Avoid leaving it under the sun for a long period of time especially if it is made out of plastic to avoid fading and cracking due to too much heat.